Talitha is my third-great grandmother on my paternal side. I have written much about the Creed line, into which Talitha married, but I know little to nothing about Talitha herself. In fact, I do not even have proof of her last name. This snippet from the 1850 census is the only paper documentation I have found that shows Talitha. According to this record she was born in North Carolina around 1808. I can find no birth or baptism record for her nor can I find a marriage record for Edward and Talitha. Based on the age of their children, Edward and Talitha were married prior to 1832. Talitha is not listed with Edward on the 1860 census, so I am assuming she died sometime between 1850 and 1860, though I can find no death record or headstone. 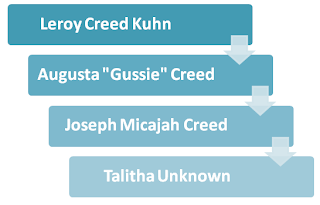 I have found other trees online that link Talitha to the Moses Cockerham family of Surry, North Carolina, but there are no documents posted to prove that. I have searched for marriage and death records for "Talitha," "Telitha," and "Tabitha" and have found nothing. 1. Research Surry County baptism records to determine if there is a record of her birth, marriage or death. Looking at your list of names is like looking at my own family names, except I have no Talitha. I do, however, have a Tabitha! Wendy, that is exactly my problem! I have a suspicion that Talitha could be a Tabitha!